When you look into the cheetah habitat in the San Diego Zoo, you’ll see a cheetah…and a dog. No it wasn’t an accident and the dog didn’t sneak in there. This was done intentionally as part of the zoo’s Animal Ambassador program. The San Diego Zoo’s “Animal Ambassadors” are a special group of animals that are trained to travel to off-site events and participate in presentations. These exotic zoo inhabitants live off the main exhibit zoo areas where they pal around with domesticated friends. The program has paired animals such as timber wolves with New Guinea singing dogs together and is most famous for it’s cheetah/dog parings. Each animal pairing situation is different and it can take anywhere from one week to three months for the dogs and cheetahs to become comfortable with each other. 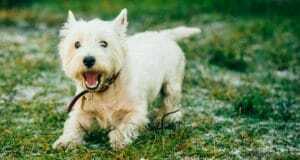 Once a relationship is established, they do everything except for eat with one another since, according to Westbrook, they don’t eat the same things and the dog would probably push the cat aside to scarf down it’s food. 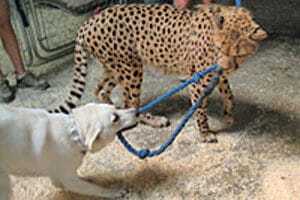 Dog/cheetah pairings are a specific bond that takes time to solidify. 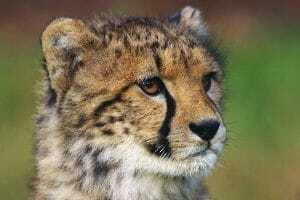 If a dog passes away, zookeepers cannot introduce a new dog to a cheetah. They simply would have to work to keep the cheetah calm and attended to as it lives out the remainder of its life. Karoo, a female cheetah lives in a habitat with Sven Olof, a male golden retriever. Kubali, a female cheetah shares her space with Bear, a male chow mix. Bakari, a male cheetah and his female husky mix friend Miley live together. Taraji, the zoo’s youngest female cheetah and Duke, a male Antolian Shepherd have the same residence. When visitors attend the San Diego Zoo, they will have the opportunity to witness the dogs and cheetahs playing and interacting together in a new exhibit called the Animal Ambassador Area, “AAA Pen” for short. The program offers a unique experience for visitors to become educated on the importance of protecting cheetahs in the wild and the opportunity to witness a special bond between cheetah and dog.